You may have encountered her fat cat enhanced masterpieces floating around the internet over the past few months, but who is the brains behind the pudgy pumpkin-colored puss paintings? The Daily Mail recently uncovered the real story behind Russian artist Svetlana Petrova, and her now infamous cat, Zarathustra who has been popping up in classic art from the likes of Da Vinci, Dali, and Monet. The cat belonged to Petrova's late mother, and it was friends who inspired her to incorporate the expressive feline into her work. 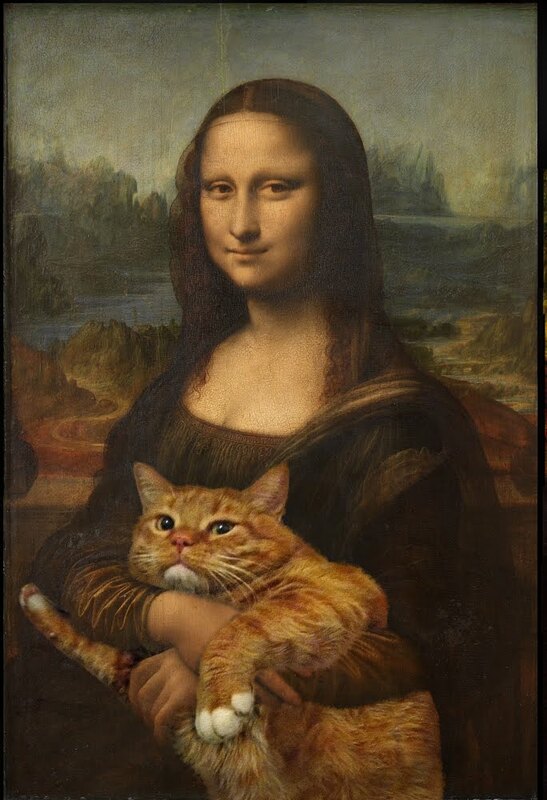 She tells The Mail: "To imagine how it would look I decided to Photoshop the cat into a painting and it was Rembrandt's Danae. It looked good so I carried on doing them. 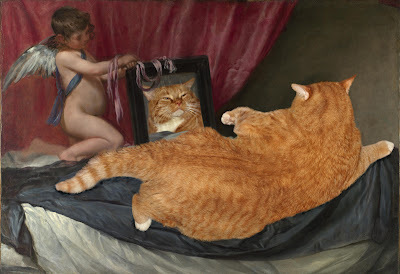 Zarathustra is a natural born model. He adores adopting different poses, sometimes very feminine and coquettish, and makes different faces. 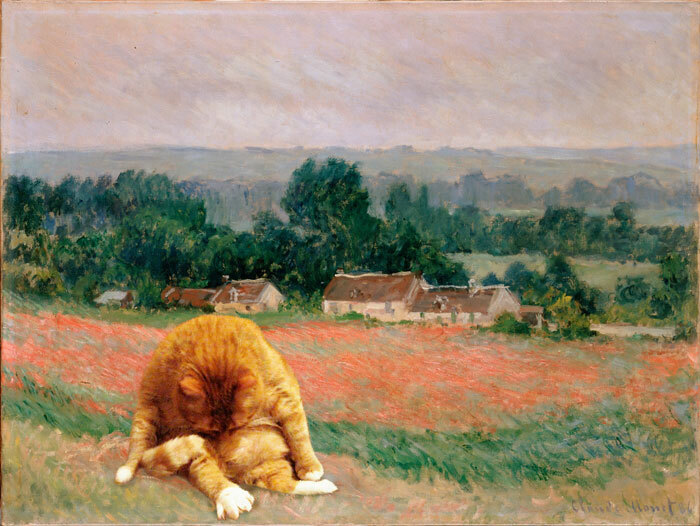 Then I started to do special photo sessions having in mind paintings which I wanted to Photoshop. It is the most difficult and longest part of work because he must be in the right position, with the correct expression, and sometimes it takes months to take the right photo." While Svetlana's website, Great Artists' Mews, has exploded in popularity, it seems as though the offline art community has not been as welcoming to her unique style of feline artifice. 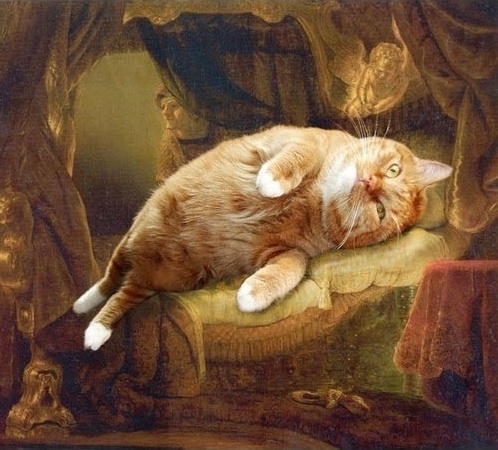 "'I thought that I could hold an exhibition, but gallery owners said: "This is not art, this is just cats," she says. Who's to say it's not both? 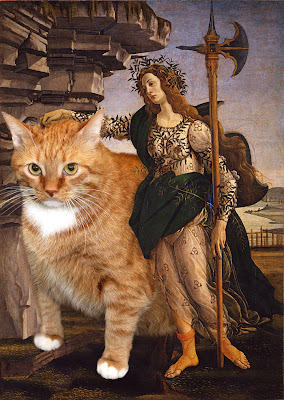 Check out more brilliant pictures of Zarathustra over at Great Artists' Mews. I LOVE this! What a great imagination!